NETinfo Plc is proud to announce the launch of the updated Alpha Mobile Banking. Alpha Bank Cyprus wanted a modern and functional mobile banking app for its customers, giving them direct access to their online banking operations and transactions, anytime, anywhere. 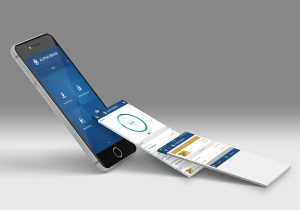 NETinfo developed and implemented a versatile mobile banking app, based on the Bank’s specifications and requests, covering Android and iOS operating systems. Alpha Mobile Banking provides an attractive User Interface (UI) and quick access to its services, while enhancing its login security, through the combined use of device recognition and biometrics or PIN. Alpha Mobile Banking provides the sophisticated tools to the Bank’s customers to conveniently perform their financial activities on the move, including a consolidated view of all their bank accounts and products they hold with the Bank, any type of fund transfers and payments and the option to send various requests and instructions to their branch. At the same time, value-added services, such as Personal Financial Management (PFM), personalisation and alerts management tools, and the ability for remote approval of payroll and other payments, ensure a state of the art customer experience. NETinfo is a versatile and innovative technology company that has been enabling digital transformation strategies for banks and financial institutions since 2001. NETinfo’s flagship products, NETinfo Digital Banking Platform and NETinfo Mobile Financial Services (MFS), have successfully been part of the digital transformation process of banks and financial institutions, in 30 countries worldwide. NETinfo focuses on retail banking, corporate banking, wealth management, and insurance. We support banks and financial institutions of all sizes across all geographies, helping them to harness the latest technologies, and we fully embrace the needs of today’s digital consumers. Industry analysts recognise NETinfo as one of the global leaders for omnichannel design and delivery. Alpha Bank Cyprus Ltd operates in Cyprus since 1998 and is a full subsidiary of the Alpha Bank Group, one of the leading groups in the financial sector in Greece, with a strong presence in the local and international market. Through a modern Branch network, Alpha Bank Cyprus Ltd provides a wide range of products and services, which respond to the demands of its customers. Moreover, it ensures a good working environment for its employees, cares for the environment, and supports social and cultural development.